Owner-operator truck drivers logged a big jump in average earnings last year but won’t see the same level of profits this year. Individual revenue for owner-operators jumped 7.7 percent, or $11,503, to an average of $160,763 last year compared with 2017 levels, according to a report issued Wednesday by American Truck Business Services. Net income also climbed, according to ATBS, despite higher fuel costs, even as miles driven continued their years-long decline. 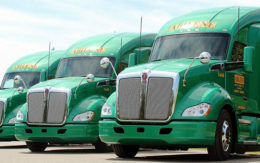 “Last year was the best year we’ve ever had for our owner-operators, on average,” said Todd Amen, chief executive of ATBS, a trucking consulting and tax firm based in Lakewood, Colo. “It was a really good year to be an owner-operator.” He spoke during his company’s webinar presenting the report. ATBS said its report is based on the performance of its 20,000 owner-operator truck driver clients and polls of partner motor carriers. But Amen warned that a cooling freight market, including lower spot market rates and increased competition from the growing ranks of owner-operators, will put pressure on owner-operator earnings this year. “Net income will flatten out and it could even go backwards a little bit,” he said. But that doesn’t have to happen if owner-operators focus on generating revenue and controlling costs, Amen said. Accepting a less-than-ideal freight load is better than sitting around with no revenue while still incurring the fixed costs every truck driver faces even when not working, Amen said. Paying attention to fuel costs this year could be the difference between making a profit or not, he said. “I guarantee you almost everyone can save $5,000 on fuel” in a year, he said. That might mean driving slightly slower — 65 miles per hour versus 70 miles per hour, for example. Drivers can also regularly check tire pressure for proper inflation, which also helps with fuel economy, he said. Idling less is another fuel saving step, he suggested. Last year, higher fuel costs took a big bite out of average gross revenue for owner-operators. The average fuel bill jumped $6,143 in 2018, eating up more than half of the gross revenue bump of $11,503, the ATBS report said. Average net income for the owner-operators increased 8.6 percent, or $5,178, to $65,360 last year over 2017 levels, according to the report. Flatbed truck drivers led the way in better earnings. Average net income for these drivers rose by $7,243 to $77,720 compared with 2017. Fuel costs per mile were up 20.9 percent, or 8 cents per mile, on average to 49 cents, the report said. Miles driven continued their decades-long decline. The average per independent driver was down 5.8 percent, or 6,355 miles, to 103,808 in 2018 compared with the prior year. Rate increases. About half of motor carriers pay by drivers by the mile, according to the study. Of those, fewer plan to increase rates paid to their independent owner-operator drivers this year. Just 25 percent plan an increase, down sharply from the 70 percent who said a year ago they planned an increase. Fleet additions. The number of carriers that plan to add to their fleet of independent owner-operator truck drivers was relatively flat at about 90 percent this year, compared with 92 percent who planned additions a year ago. About 10 percent of carriers will increase their fleet by more than 20 percent this year, about the same as last year’s 11 percent share. More owner-operators. The number of owner-operators grew by about 8 percent or 10,000. ATBS said it predicts a healthy year for the trucking market, based on its historical performance. “2019 is not starting off as well as 2018 did — 2018 was a year for the record books,” Amen said. “But we are still in a good trucking market. New federal data show driving a big rig is among the most dangerous occupations, with record number of heavy-duty trucking deaths in 2017.